Protect your fence from the harsh winter weather with these tips! Winter is right around the corner. We have seen a drastic drop in temperature in recent weeks and experienced a few snowy days along the east coast. If you have a fence on your property, you may need to take precaution. Winter weather conditions can be relentless can easily cause structural damage to your fence. This is especially the case if your fence is not made of metal. It is in your best interest to take some precautionary measures to ensure that your fence stays in good condition throughout the winter season. In general, children love the snow. It sometimes prevents them from having to go to school and what child doesn’t like playing in the snow? Adults, on the other hand, are typically on the opposite end of the spectrum. It usually just creates more work and is a hassle when it comes to driving. 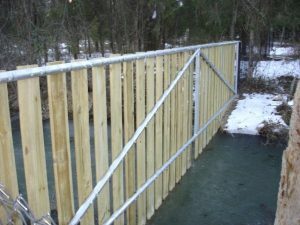 If you are a fence owner, it is a good idea to remove snow at the base of your fence to prevent water damage. It is also a good idea to remove any snow that has accumulated on the top of your fence. Snow is heavy and easily cause serious damage to your fence if too much of it piles on top of it. Harsh winter weather can cause tree branches to fall. All too often, fences are ruined because tree branches have landed on top of them. That being said, spend some time every so often surveying your property for suspicious tree branches. In many cases, you are best off removing them before they cause you issues. Don’t wait to make repairs to your fence. If you have noticed that is a problem, you will want to address it as soon as possible. Winter weather can easily cause damage to a fence so keep an eye on yours over the next few months! Whether you want a charming picket fence or a colorful vinyl fence to protect your pool and keep your property and family safe, Hercules Fence has the expertise and equipment to repair or construct your dream fence. Whether it’s a minor repair or major replacement, we would love to help your vinyl coated chain link fencing better serve your family. Our experienced team can help meet your fencing needs, whether they’re residential or commercial, for the right price. Give us a call at 804-752-7992 or visit us online. To see examples of our work and keep in touch, don’t forget to follow us on Facebook, Twitter, Google+, LinkedIn, Flickr, and Pinterest. This entry was posted on Friday, January 5th, 2018 at 5:01 pm. Both comments and pings are currently closed.